Arrival into Frankfurt was on a Lufthansa connection flight and therefore do not experience check-in for ANA. On arrival there are 3 Lufthansa staff offering “live” connection information and this is excellent. It is quite a lengthy walk from Terminal 1 A gates to B gates for the FRA-HND departure and security is quite busy and slow. In total from arrival to my new gate it takes about 35-minutes but luckily I have allowed ample time. Boarding has a short delay but this is well communicated by the gate staff (several times). Priority boarding is offered and this is followed by the main Economy Class cabin. It is a very busy flight and the staff are efficient with assisting customers with hand baggage to speed up the process. Staff at the door and throughout the cabin offer some sort of greeting to passengers and this is a pleasant touch. Landing cards for Japan are handed out early during boarding and this is most useful. Boeing 777-300ER in Economy Class with just a few spare seats observed after boarding is complete. Passengers are allowed 2 checked in bags of 23kg each on International flights. A cabin bag of 55cm x 40cm x 25cm (22 × 16 × 10ins) weighing up to 10kg is allowed in addition to a small personal item (laptop bag, hand bag, rucksack etc). As I completed online check-in rather late and this flight was so busy there was not much seating choice left. I opted for 42A – a window seat which is on the last row of Economy Class. Whilst this backs on to the washrooms and galley I did not find this intrusive. ANA have retained the more spacious 9-across configuration on this aircraft and this is offered in a 2x4x3 layout which in my opinion is the best and most versatile available for this aircraft. The cabin is small (just 13 rows) and is quietly intimate. 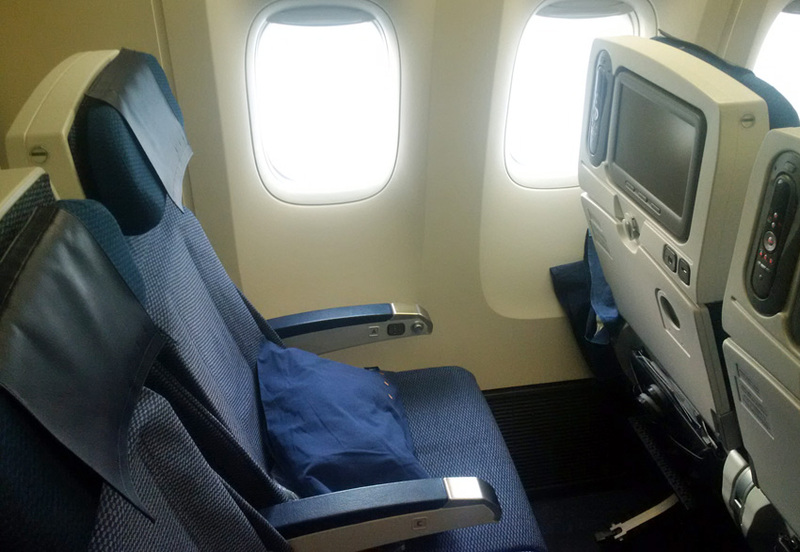 ANA offer a 34-inch seat pitch which is wonderfully spacious by today’s long haul standards. The seat is designed with a non-intrusive recline e.g. the seat back is fixed and base slides forward. I personally prefer this design as you do not get the intrusion from the forward seat when working or during the meal service. Whilst you lose some legroom if you do “recline”, with the additional seat pitch I do not find this to be a particularly negative factor. The seat has all mod-cons – 110v PED power, USB and 11-inch PTV. The tray table is large and there is also a cup holder built into the seat back. The cabin is immaculate on boarding and this cannot be faulted in any way. There are 4 washrooms at the rear of the cabin and 2 in the central galley area between Economy and Premium Economy – the washrooms in the centre are the larger variety. They are spotless shortly after take-off and remain clean during the flight. Hand soap and a moisturising cream are provided. The flight pushed back about 30-minutes late and departed 30-minutes behind schedule – this is well communicated both on the ground and apologies are made again once boarding is completed. It is handled well overall. We arrive in Tokyo Haneda just 10-minutes late and even for this short delay the staff are once again apologetic. About 30-minutes after departure Japanese bottled spring water is served from a cart with a towelette sachet. 10 minutes after this rice crackers are offered with a full bar service conducted 5 minutes later – this includes a full selection of soft drinks and juices, wine, beers and spirits (although you need to ask for these as they are not displayed on the cart). Whole cans of soft drinks are served and the staff did not have any issue when I ask for 2 drink choices. The meal tray is served around 1h20m into the flight and for this late morning departure this feels satisfactory. ANA do not offer personal menu cards but staff show a communal item where customers can see the choices. 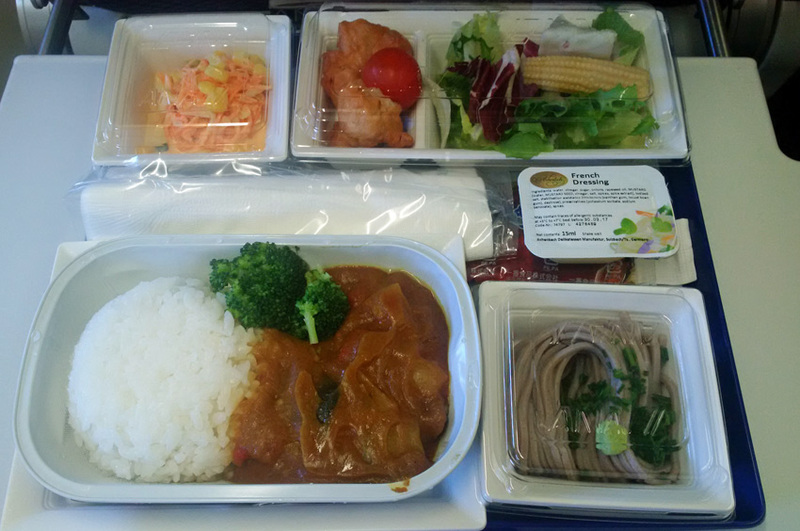 There are 2 entree choices : salmon with soy sauce and rice or beef and vegetable curry with rice – whilst the staff offer the curry as the “western” option I would say both are aimed more at local Japanese customers in terms of style and for some passengers this may be disappointing. I opt for the curry which is very nice, it is lightly spiced and served with Japanese style sticky rice and broccoli. There are 4 appetiser choices on the trays – coleslaw, fried chicken, green salad and soba noodles. Bread is only offered with the curry according to the menu, but I don’t receive this. The staff offer a pot of ice cream for dessert. An additional bar service is offered with the meal tray and this is followed a cart with tea / green tea and coffee. 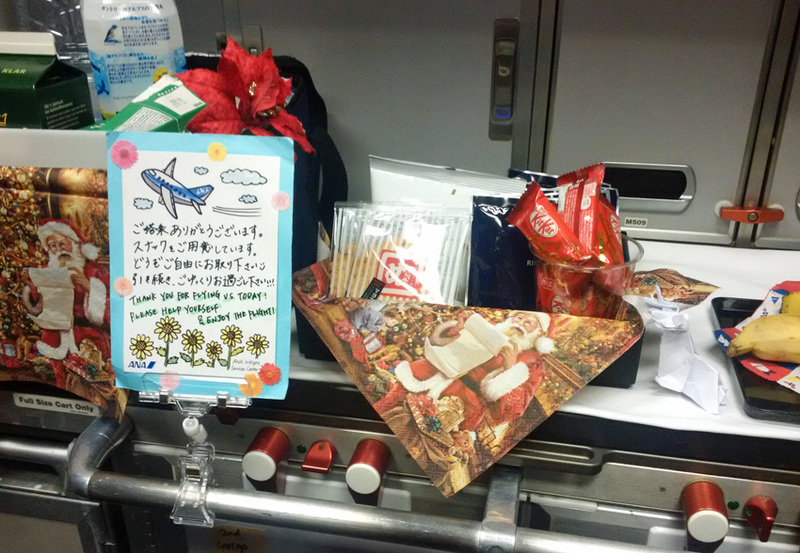 During the flight the staff are quite attentive with offering drinks and there is a self-serve display in the central galley with drinks, potato chips, chocolate, rice crackers etc – this has been nicely set up with a note from the staff and festive Christmas napkins that I am told the staff purchased from a local German Christmas market. It is a pleasant upgrade and the attention to detail is not something one typically expects to find in Economy Class. Breakfast is served around 2-hours prior to arrival. 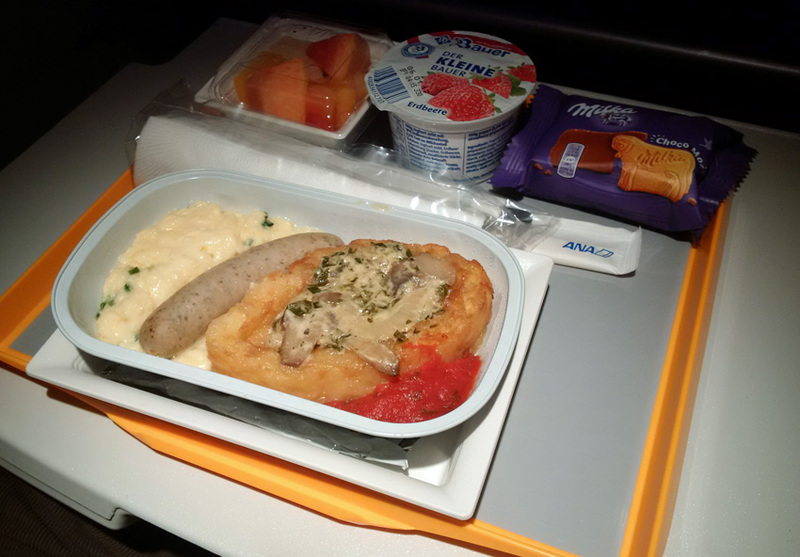 Again, there are 2 options available – Japanese rice porridge and western options of sausage, hash brown, mushrooms etc and fruit and yoghurt are on the meal tray. I opt for the western breakfast and the quality is excellent – disappointingly there is no bread with the western meal tray. This B773 offers full AVOD entertainment – the hardware is excellent. The user-interface is not as intuitive as other airlines and does not maximise the touchscreen functionality e.g. it does not function in a tabulated manner like an iPad and this can make scrolling through the options slow and tedious. The selection includes 24 Hollywood films (recent and classic), 11 Japanese, 17 world movies (in a variety of languages – Korean, Hindi, German, French, Spanish etc) and 8 Kids films. There is a decent selection of TV choices and this includes some drama box set choices but no comedy. It is certainly not the most extensive selection but the overall there is enough to keep me entertained during the meal services. 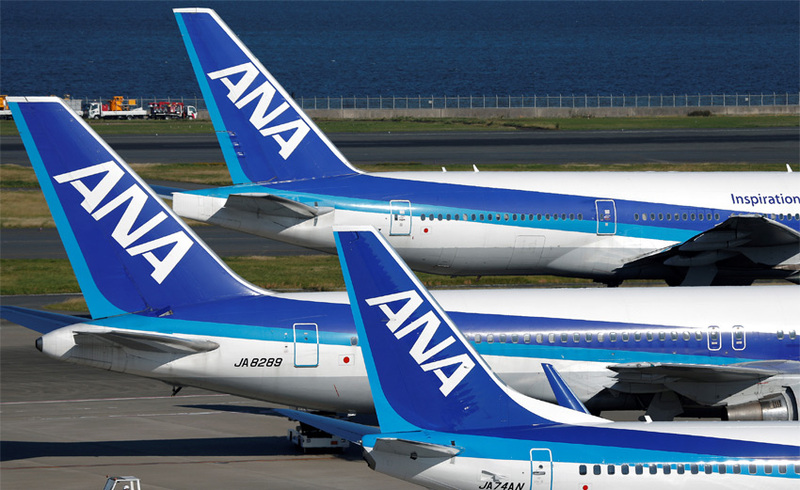 ANA have equipped these Boeing 777-300 aircraft with WiFi through Onair. There are various packages available and whilst all are sold with time limits eg. $19.95USD for the entire flight, this has a 100MB data cap which is limited. The WiFi does work for the entire flight but with the fair use policy in place on this aircraft it is not that functional for anything other email or instant messaging. You can’t really do a lot with 100MB in this day and age. Pillows and blankets are available on each seat prior to boarding and the quality is good. The pillow has a proper fabric cover (rather than disposable) and the blanket is the thicker modacrylic which is becoming increasingly rare – both are nicely branded with the “Inspiration of Japan” logo. There is no offer of any eyemask / ear plugs etc which in my experience a few airlines still offer. There is no hot towel service and ANA now serves a cold towelette sachets before each meal – the quality is fine. The staff service is strong throughout. For a daytime departure the flow of service is pleasant and it nice to see that ANA have maintained the pre-meal beverage service. During the service and in the galleys the staff are quite proactive to chat with passengers and English language skills are good for Japanese staff. There is 1 European member of staff available onboard. As the flight departs Frankfurt I did not see much evidence of German language skills (all announcements are in Japanese and English), although I would estimate that 90% of Economy Class passengers are Japanese. Mid-flight service is proactive and staff remain visible to customers, their body language is consistently good and staff make good eye contact and will engage with passengers proactively in the galleys. There is very little to fault with the service from a customer service or efficiency perspective. There are 3 staff available on arrival to meet short connection passengers and offer transfer information. Immigration queues at Haneda are quite long early morning and baggage is arriving by the time I get through. Again, there are several staff to assist with enquiries. An excellent experience. From a product perspective there is little to fault and this is complimented by a very good standard of service from the cabin staff. If there is any weakness it is the IFE, but this is being critical. For the price paid, this was pretty much a perfect Economy Class flight.